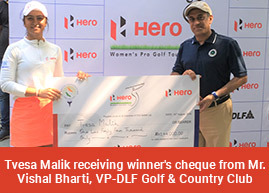 Greater NOIDA, Feb 23: Gursimar Badwal bounced back from her indifferent second round to log a second sub-par card of 70 during the week to claim the fifth leg of the Hero Women’s Pro Golf Tour 2018 at the Jaypee Greens. The 24-year-old Kapurthala golfer, who earlier won the third leg at Poona Club Golf Course, became the first multiple winner of the season and also moved to the top of the Hero Order of Merit. The winner, Gursimar, played flawless golf and had three birdies against no bogeys when she arrived on the 18th tee. She bogeyed the 18th as overnight leader Neha Tripathi, playing behind her, birdied the 17th. That meant Neha needed a birdie on the closing hole to force a play-off. However, she managed only a par and was left stranded in second place. Gursimar, who started the final day in fifth place and three shots behind Neha (74), totaled even par 216 for 54 holes and won by one shot despite a closing bogey on 18th. Neha paid a heavy price for her scratchy front nine where she not only bogeyed three times but also dropped a crippling triple bogey on the Par-3 fifth hole. Neha, who held the sole lead after two rounds, shot four-over 40 on the front nine and despite a two-under 34 on the back stretch of the Jaypee Greens layout, Gursimar pipped her by a shot. Interestingly, this was Neha’s third runner-up finish in the 5 events played so far, with Gursimar edging her out on 2 occasions. The pleasant surprise of the week was amateur Tanirika Singh, who put up a consistent show. Her final round of 74 earned her a sole third spot ahead of many established players. Saaniya Sharma (76) and Afshan Fatima (76) were Tied-4th after a disappointing final round. They both began the day at Tied-second, but failed to pose a challenge after giving away too many strokes on the front stretch. Tvesa Malik had three birdies against five bogeys in her 74 and finished sixth at 5-over 221. Anisha Padukone (80) was undone by two holes – a double on Par-5 13th and a quadruple bogey on Par-4 18th. Those six dropped shots saw her finish at 80 and she was seventh.